Offering a wide range of Decorative Sinhasan to our valuable client in different specification to meet the diverse requirement of client. These are made from high quality raw material. 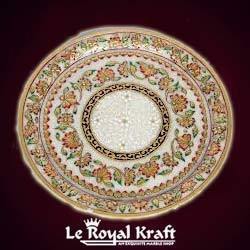 All the aasan that we offer are carved using optimum quality marbles that are obtained from authentic market vendors. Fine Decorative Marble Standing Watch Available In Different Designs & Sizes. We design Calligraphy Work in marble Gold as per client’s requirement. Beautifully crafted our range exhibits true workmanship and perfect finish. Varying in thickness and colors, these are in high demand by our clients spread across the globe. We are one of the ecstatic polished Italian marble importer. Our Italian marble is highly preferred by quality conscious people. Polished Italian marbles from our house are excellent for roofing, wall cladding, and flooring. They are widely demanded nationwide for their long lasting shine and imperial appearance. 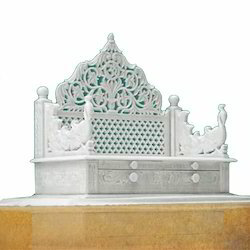 White Marble Taj Mahal, sizes: 3', 4', 5', 6', 9', 12'. Different design of Abstract Marble Handicraft is provided to customers, which is designed by our talented designers using advance techniques. It is highly appreciated amongst the customers due to its elegant look and design. beautiful marble stone article . home and garden decoretive article .